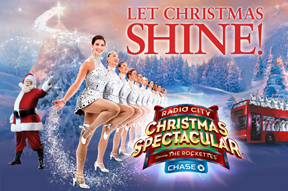 REVIEW: "The Radio City Christmas Spectacular"
If you've never seen the Radio City Christmas Spectacular starring The Rockettes, now is the time to get yourself to The Wang Theatre. And if you've seen the show before, you owe it to yourself to make a return visit. While the show has always been entertaining in its previous visits (touching upon pretty much every Christmas song ever written), this year's production has been given a nice polish with some new material and a dynamic technical update. As well, the show now has an actual finale where past versions simply stopped and turned up the house lights like it was last call at 2 a.m. The biggest improvement is the 50 foot LED screen that adds tremendously to the production value of the show. From Santa taking off from the North Pole to video backdrops for various dance numbers, this element provides a huge boost to the look and feel of the show. The two best showcases of the video wall come with a Santa dance number showing how Santa is, indeed, everywhere -- to infinity, in fact -- and a dynamic "New York At Christmas" production number that has the Rockettes boarding a double-decker tour bus and traveling around midtown Manhattan. The effect is dizzying as the ladies climb onboard in front of Radio City Music Hall, travel down Sixth Avenue to Rockefeller Center, stop for cute photo op, head to Central Park and wind up in Times Square for a high-kicking finale (above). The full-sized bus has been carefully choreographed to spin, turn and angle itself in front of the highly detailed computer generated video to give the feeling you're actually on the bus zipping around town. The Rockettes are as sharp as ever. Their precision dance work is legendary and the ladies at The Wang never disappoint. Their first big number is "The 12 Days Of Christmas," and while they've used the song in the past, this year comes with completely new choreography. They also offer the classic "Parade of the Wooden Soldiers," which shows off their expert precision big-time, ending with the famous slow-motion fall that draws a huge audience response. The Radio City Singers entertain between the production numbers, the Radio City Dancers don costumes to present a cute version of "The Nutcracker," and the Rockettes return again and again, from Raggedy Ann dolls to a shimmering pyramid of dancers surrounded by a virtual tunnel of glittering diamonds (at left). In another new number, Santa treats two young brothers to the true meaning of Christmas at The North Pole. The audience also gets to enjoy an entertaining mini-documentary about the formation and history of the Rockettes. The new elements have been part of the New York production in the past, but no matter, as this is the first time Boston audiences have experienced them. The Living Nativity is also back, but this time given a wise update by having the two brothers read the story rather than having that booming recorded voice echo throughout the theater as in previous visits. The Living Nativity features majestic costuming and live animals, including two camels, sheep and a donkey that, on Opening Night, stopped while walking across the stage to turn and give a hilarious glare at the audience that could probably never be duplicated. The theme of the show is "Let Christmas Shine," and this year's production does that exactly that -- from start to finish. 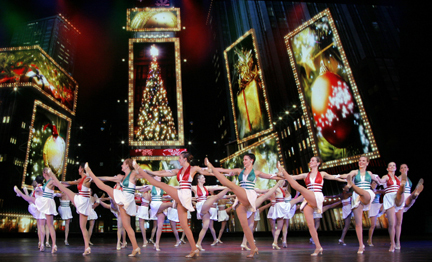 "The Radio City Christmas Spectacular" is at The Wang Theatre through December 30. For information, call 1-866-348-9738.